Good news for all the iPOD lovers who store and view photographs, videos and movies on their iPODs. 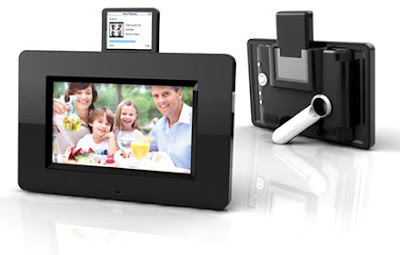 Mustek Digiframe PF-i700 is an ultimate iPOD docking accessory to view all your favourite iPOD content on a large LCD screen. The digiframe comes with 7" display, 480 x 243 resolution panel, stereo speakers, a headphone jack, USB port and support for SD, XD, MMC and Memory Stick / MS Pro cards. Your blog is amazing and I love it, please do keep up the good work ! I loved your post regarding naming all photo files, this will save lots of time- thank you. keep up the good work and happy new year to all your hard working team. Thank you very much. And wish you happy new year.